Herbicide injury caused from shoot inhibitors including chloracetamides such as acetochlor, alachlor, dimethenamid-p, S-metolachlor, and others that block the formation of long-chain fatty acids. Also, herbicide injury caused from shoot inhibitors including thiocarbamates such as butylate, EPTC, and others that block lipid synthesis. Typically, sensitive plants either do not emerge or lodge shortly after emergence. Leaves malformed and looping perhaps including crinkled or wavy leaf margins. Leaf tips tend to fuse and often do not emerge from the coleoptile. Water-soaked or necrotic spots or lesions on new growth, caused by emulsified formulation application to young, tender foliage. Stand reduction and stunting, often associated with unseasonably cool, moist weather following soil treatment. Chlorosis in new growth. Certain ornamental plants with pigmented foliage (such as red-leafed loropetalum) may have reduced intensity of the pigmentation. 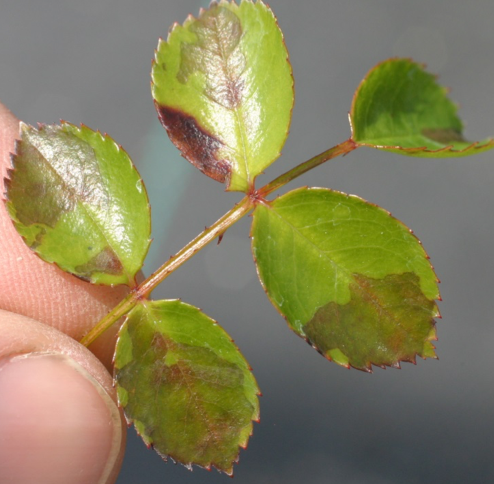 S-metolachlor emulsifiable concentrate “contact” injury to young rose foliage, one week after treatment. Older foliage and new growth after treatment unaffected. Identical injury observed with dimethenamid-p EC. S-metholaclor injury to cleome. Contact injury following an overdose of the herbicide. Shoot inhibitor herbicides are soil applied, preplant incorporated, preemergence at planting or post-transplant. The herbicides are absorbed by germinating seedling shoots/roots prior to or at the time of emergence. Annual grasses and nutsedge are the primary targets but some small-seeded broadleaf weeds are also controlled. Herbicides can be absorbed by foliage when applied over new growth. Shoot inhibitor injury symptoms are visible in just a few days following treatment. The chloracetamides and thiocarbamates show active soil movement even in higher organic soils, unlike the root inhibiting dinitroanilines. Injury symptoms from foliar sprays are typically restricted to contact injury on foliage present at the time of treatment, or malformed growth on new shoots forming soon after treatment. Contact injury to foliage from emulsified formulations resembles foliar injury from most contact-acting herbicides such as diquat, paraquat, natural oils, pelargonic acid, or PPO inhibitor herbicides. 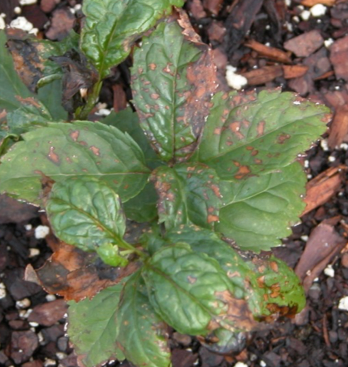 Organic solvents such as oils may cause similar necrotic spots on the foliage. Epinasty resulting from synthetic auxin application. But, synthetic auxin herbicides will affect broadleaf plants and typically have no symptoms on grasses or sedges. Shoot inhibitors symptoms are commonly observed on grasses.